Wow, I’m back!! With a new server and all working correctly. I apologize for that bad timing in server issues. Valentine’s Day is tomorrow and I’m looking forward to getting some good valentine candy surprises, as well as giving of course! I was asked to review the new 3 Musketeers Mini’s candy that is pretty new and great for Valentine’s Day. If you’re a regular reader than you know I’m not the biggest chocolate candy fan but I do like some. The regular 3 Musketeers chocolate bar was one of my favorites as a kid, as well as Mars. I think because it wasn’t totally chocolate. 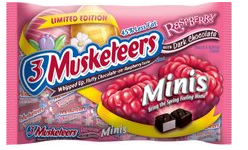 Now available by Mars Company are 3 Musketeers Mini’s in Raspberry and Cherry flavors. I believe this is similar to the Baskin Robbins minis that I reviewed in the video. This Valentine’s Day, chocolate loves can indulge in the perfect flavor combination of cherry nougat dipped in dark chocolate with 3 MUSKETEERS® CHERRY limited edition. Combined with 45% less fat than the average leading chocolate brands, 3 MUSKETEERS® CHERRY limited edition is a delicious chocolate treat you can enjoy without the guilt. The great thing about these minis are that they are individually wrapped and easy to pop in your mouth and eat. The retail price for each 9oz bag is $3.29 and can be purchased almost any chain store like Walmart or pharmacy. The main two flavors are Cherry and Raspberry with cherry nougat and raspberry nougat dipped in luscious dark chocolate. They are also listed on Ebay as well. Am on my way to the store soon and these are on my list. Thanks for the review. Hmmm I love berry mixed with chocolate. I’m not sure I’ve seen these at the stores. It’s so fun to get to “visit” the blogs from Bloggy Carnival now that I have time and can read and post.